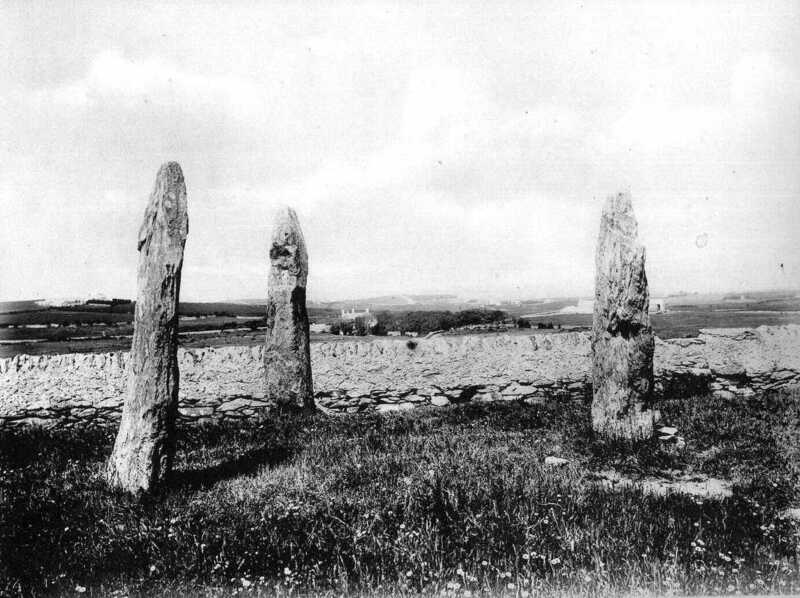 These pillar stones, which were mentioned in connection with the preceding view, I do not believe were ever part of a Cromlech. The stones are not strong enough to support a heavy capstone at such a height and distance apart. From the singularity of their orientation it struck me forcibly that their original use might have been for some astronomical purpose, as these are situated so that the line through the eastern and western pillars is directed roughly towards the point of sunrise and sunset at the time of the vernal equinox, and the other pillar points to the south, where the sun is at noon. Or perhaps, as Pliny tells us ( see Mythology of Aryan Nations), such upright stones and obelisks were so many monuments dedicated to the Sun-god, who may have been worshipped by our remote ancestors. The dimension of the western pillar is as follows:- Seven feet high by two feet five inches wide, and one foot thick at the bottom and nine inches at the top, and is nine feet and two inches from the eastern pillar. The eastern pillar is six feet two inches high and nine inches thick, and two feet nine inches wide, and is ten feet from the southern pillar. The southern pillar is seven feet high and three feet wide by six inches in thickness, and eight feet from the western pillar.